In 1964 The closing of Vatican II took place and the ethical and moral structure of Western Civilization was shaken. The change from absolutes in decision making was affirmed while an attempt was made to hold onto absolutes in moral realms. 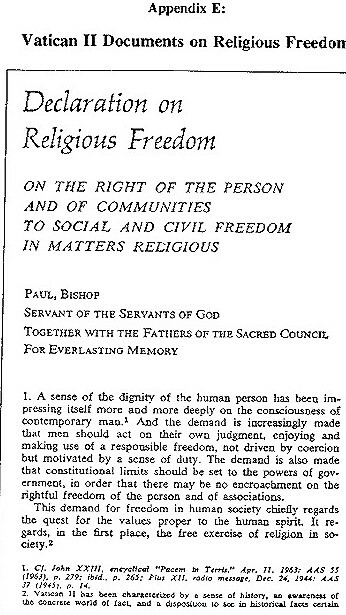 The documents on Religious freedom are the most epoch making of the total pronouncements of Vatican II. A reading of the documents chosen will illustrate the new Vatican II affirmation by the Papacy that an individual is responsible for the decisions that effect his eternal destiny and that no one else can make those decisions for him, This therefore, effectively states that there is no priest, no pope, who can make your decisions for you. This freedom of existential decision making goes far beyond the freedom of conscience claimed by Luther and other early reformers. Read these pages carefully for an insight needed to understand the moral changes since 1964 in Western Ethical thinking.